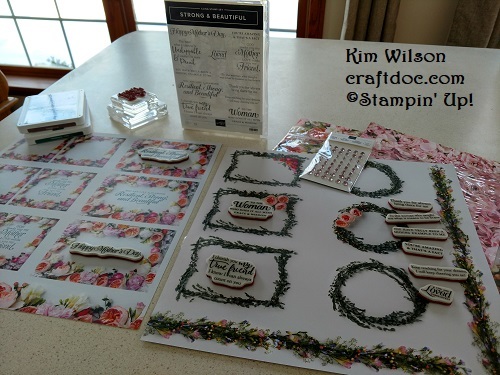 CRAFTDOC » Storage by Stampin’ Up! I am over the moon – starting April 1, we will carry modular storage for ink pads, markers, blends and more! Shoot me a message if you want more info, but for now here’s a picture of a sample layout. Sale-a-bration ends in less than a week, so I’m rushing to share the rest of my projects. 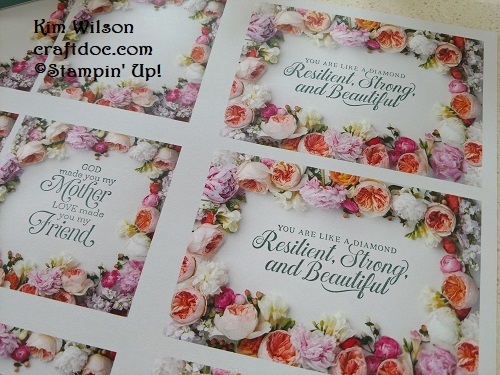 Part of My Story is a fun stamp set with phrases suggested by demonstrators. And it’s free! The matching Story Label punch is a great pair for other stamp sets too, such as the sentiments in Humming Along. Remember this beautiful split panel card from my February class? 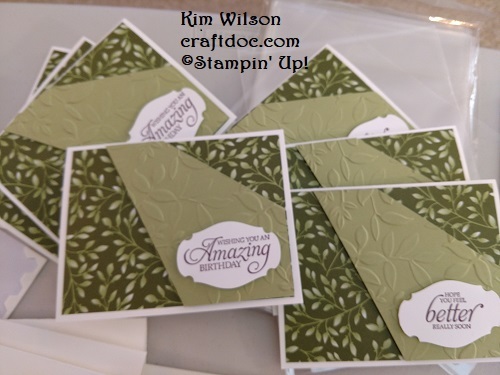 Well I couldn’t let those middle panels go to waste, so I embossed them all and made a whole new batch of cards! The Petal Promenade is another free choice for Sale-a-bration. (And it’s also in the Annual Catalogif you are looking at this post after SAB is over). 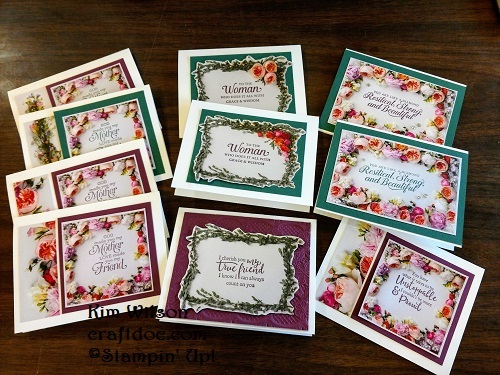 The stamps from Strong & Beautiful are the perfect fit for the frames roses and greens. 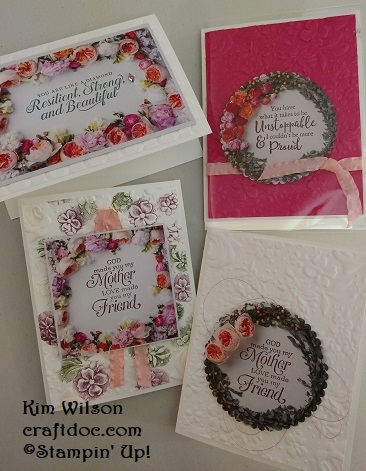 I had a few extra panels after playing with the Country Floral embossing folder (another SAB freebie). 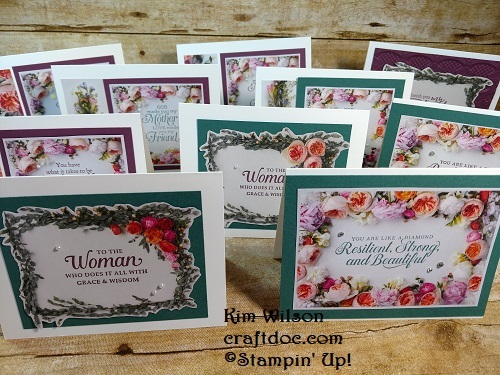 And here are some even easier cards with a simple cardstoc mat for the floral sentiment. NOTE: Fresh Fig and Tranquil Tide are retiring – SAB is a great time to stock up on ink, cardstock and adhesives. Add a few pearls or rhinestones too. 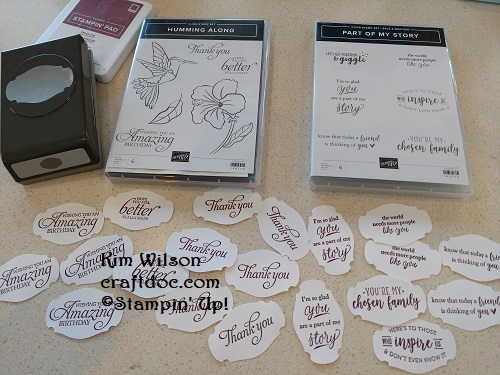 If you are wondering whether to join Stampin’ Up! this week and get the extra Sale-a-bration free product, or wait until April 1 and get some of the new storage in your kit – send me a message and I’ll help plan the best option for you! Here’s a quick link to my website.